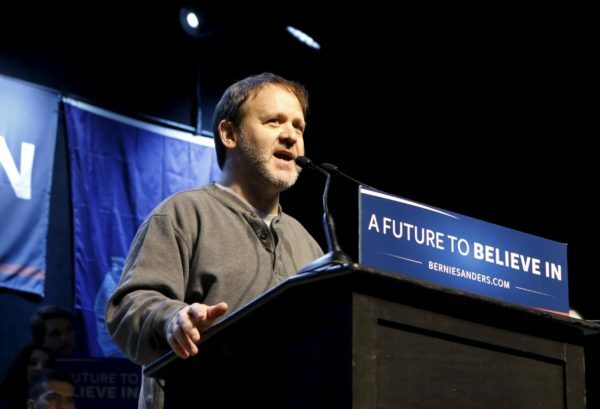 Jon Fishman, drummer in the band Phish, introduces U.S. Democratic presidential candidate and U.S. Senator Bernie Sanders at a campaign rally in Portland, March 2, 2016. Fishman has been elected as a selectman in Lincolnville. LINCOLNVILLE, Maine — The drummer for the rock band Phish has been elected to public office in an unusually star-studded election for the town’s five-member selectboard. Jon Fishman, the Phish drummer, and Josh Gerritsen, a designer, filmmaker and son of novelist Tess Gerritsen, were the top-two vote getters in Tuesday’s local elections. They will fill the two vacant seats on the board. Gerritson received 370 votes to Fishman’s 356, beating out local historian Sandy Delano, who brought in 227 votes, according to unofficial results released by the town Tuesday night. Fishman said he was inspired to run for local office by the campaign of former presidential candidate Sen. Bernie Sanders, I-Vermont. Fishman was active in Sanders’ campaign, speaking at rallies leading up to the election. Gerritsen directed “Island Zero” a Maine-based film about an island that’s cut off from the world when the ferry mysteriously stops coming. The movie is expected to be released later this year. His mother, Tess Gerritsen, is credited as the writer. She started out writing romantic thrillers in the late 1980s before shifting her focus to medical thrillers in the late 1990s.